Built on top of the flat data grid, the HTML5 hierarchical grid delivers on master-detail displays with no compromises. Bind the hierarchical grid to a variety of data sources including JSON, XML, .NET collections, and even .NET DataSets. Use load-on-demand to deliver any amount of data to client. Included are interactions that you need for your enterprise apps – data editing, sorting, filtering, column resizing, column summaries, paging, and more. The Ignite UI Spreadsheet component provides your users with a powerful yet familiar way to manage data. The Spreadsheet component can import and export data from Microsoft Excel (both locally and remote) and supports most of the Excel objects. All data formatting is supported, so what your user sees in Excel is what they will see in your web application and vice versa, including colors, fonts, grid lines, headings, and text/data formatting. The Spreadsheet component supports all of Microsoft Excel’s built- in formulas (Sum, Average, Mean, Median, etc.) so your calculated data will always be available. Deliver mobile-first and touch-first experience to your customers out of the box. Designed for modern touch and responsive web, you can feel safe building apps that run on any device size. Use the Ignite UI Layout Manager, Tile Manager, Splitter, or even Bootstrap to build responsive, beautiful applications with a wide variety of built-in customizable themes. With Angular, we are committed to ensuring that Ignite UI delivers Angular support inherently. All Ignite UI controls have component definitions with Angular and are hosted on GitHub. Our KnockoutJS support delivers dependency tracking, templating, and automatic UI refresh using Knockout’s easy mapping of DOM elements to your data model. Get the full power of Visual Studio with our MVC components. Use the most powerful IDE in the world and your C# expertise to build complete, modern web experiences. Give your users the interaction experience they expect, such as prioritizing data visibility with a fixed column or collapsing groups of data. 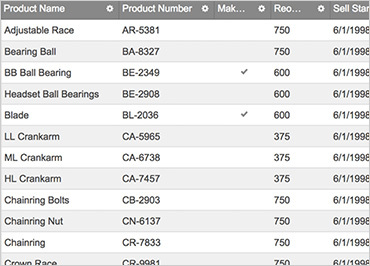 Features like data entry, grouping, sorting, paging, filtering, column templates, column fixing, collapsible column groups, and more are available in the grid components. Customize column layout based on screen size with our built-in responsive design features. This feature lets you hide columns, template columns, and change the entire data display based on the device screen size. Built-in DOM virtualization and paging features allow you to expose thousands of records in no time. Load your data on demand from your backend services to minimize loading time for your applications and to bring a premium user experience to your customers. Work with any data source – local XML, JSON, HTML table, or a remote web service. 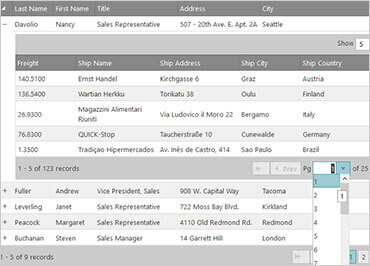 Utilize client- and server-side sorting, filtering, paging, summaries and grouping for your data. Allow your customers to easily find what they are looking for. Edit multiple records and save them all at once with the batch editing feature. Or, edit data inline within the cell using templates with custom editors that match the column’s data type. This allows for adding new rows and deleting rows within the grid. Validations can also be done real-time within the grid cell. These, and many more functionalities enrich the performance of your applications. The OLAP Pivot components include a Pivot Grid, Pivot Data Selector, and Pivot View, which enable you to perform in-depth, multi-dimensional data analysis and read OLAP data. The components can be used with flat tables or XMLA data sources for delivering high data presentation quality. 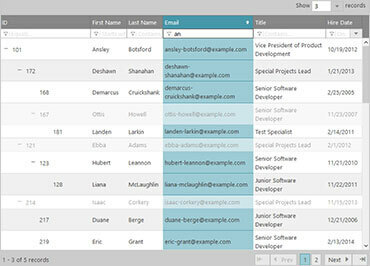 Combining a Pivot Grid and Data Selector, the Pivot View component provides the tools users need to manipulate multidimensional data in one place. As part of the Business Intelligence category, the Online Analytical Processing (OLAP) approach allows for visualizing multi-layered analytical and ad hoc queries with a swift execution time. Use hierarchies as columns, rows, or filters and choose among multiple layout modes, depending on how much space you have. Choose the data you would like to display, relevant to your analysis.